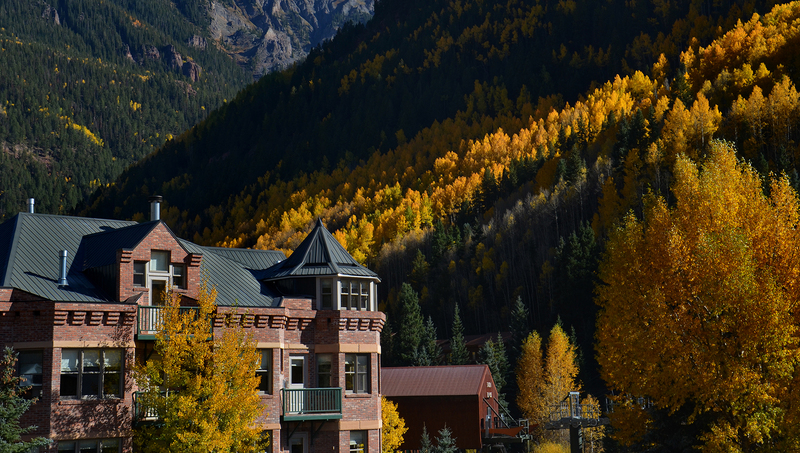 Highly acclaimed luxury boutique hotel in downtown Telluride. 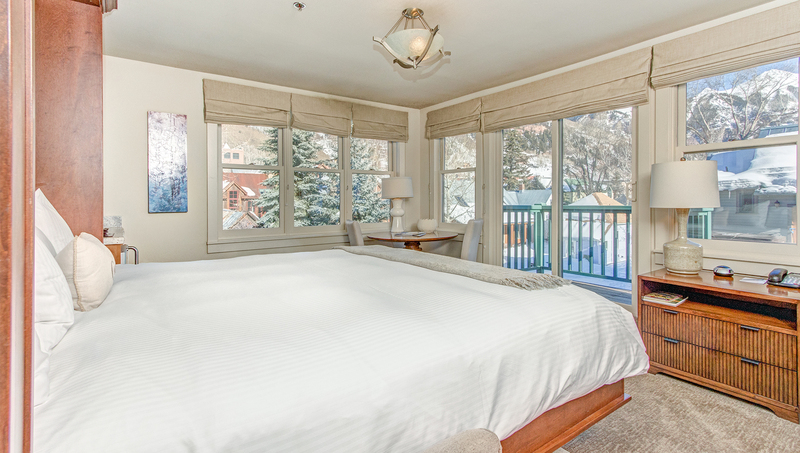 21 luxuriously decorated guest rooms range from studio-style rooms to a 3 bedroom penthouse. Most rooms have balconies, fireplaces and kitchenettes. 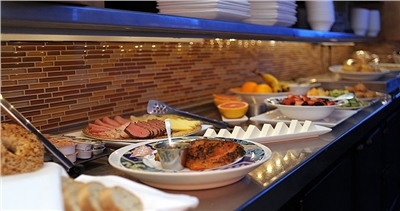 Stays include European hot breakfast. Other amenities include robes, safes and AC in every room. Most rooms are pet-friendly at an extra charge. 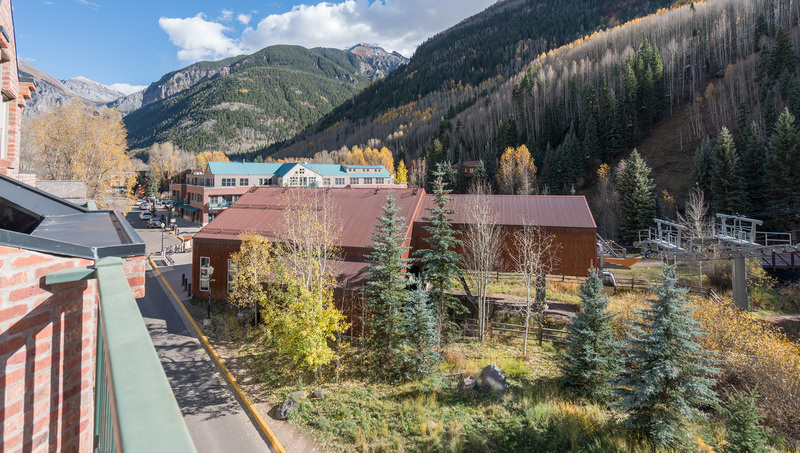 Valet parking is available at the property at a nightly charge. Premium king hotel room on 2nd floor of Hotel Columbia. King murphy bed, queen sleeper sofa. This hotel room has a king sized murphy bed along the northern wall. 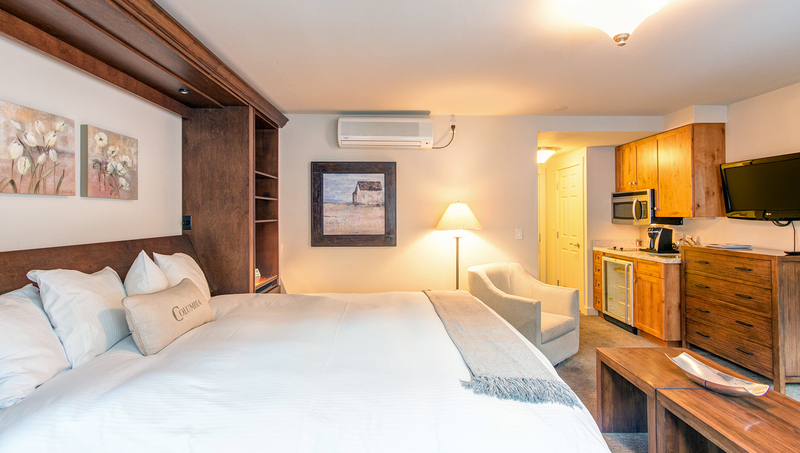 It also features a kitchenette with 2 burner stove top, full-sized fridge, microwave and Keurig coffee system. There is a dining area with seating for 3 guests. 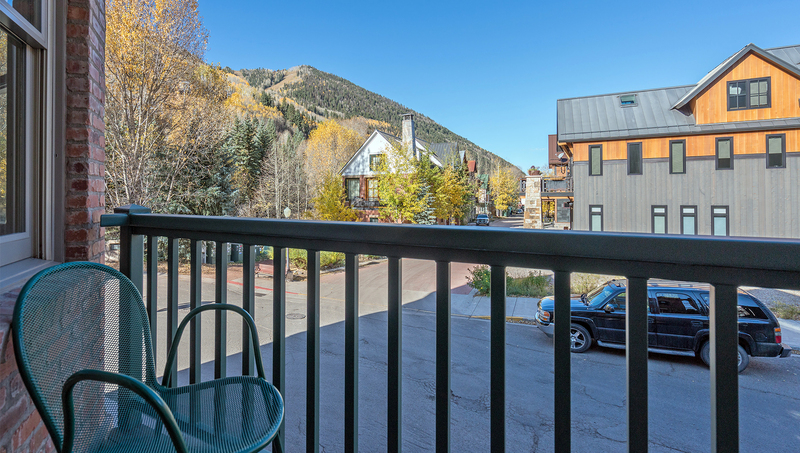 The sitting area offers lots of light and has a leather queen sleeper sofa, gas fireplace, flat screen TV and western views of Telluride. There is a large walk-in closet with 2 plush robes and a safe. 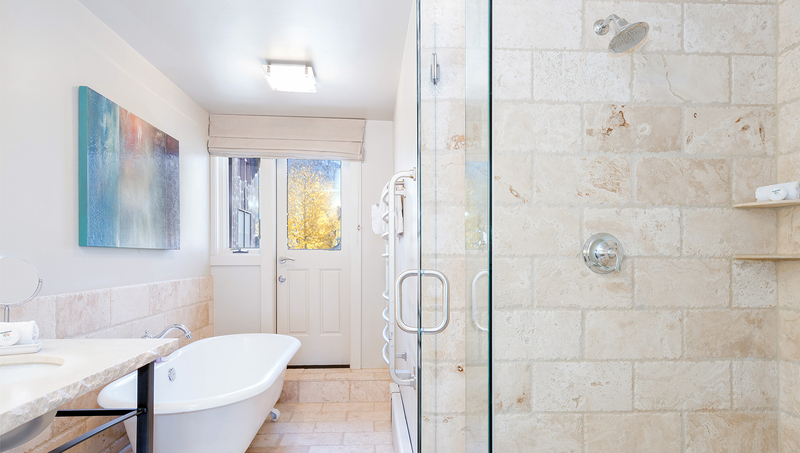 The large bathroom has a claw foot tub, heated towel dryer and separate walk-in shower. There is also a small deck off the bathroom. This room is pet-friendly at $30 per night. 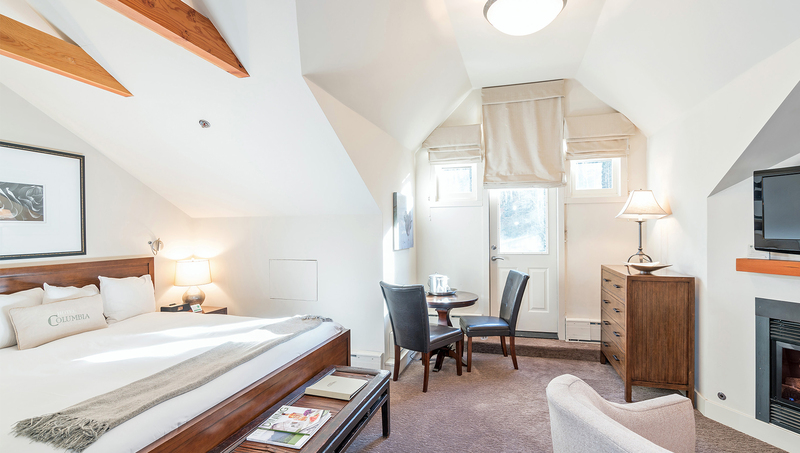 Premium 1BR suite on 2nd floor of Hotel Columbia. King murphy bed, king bed, queen sleeper sofa. 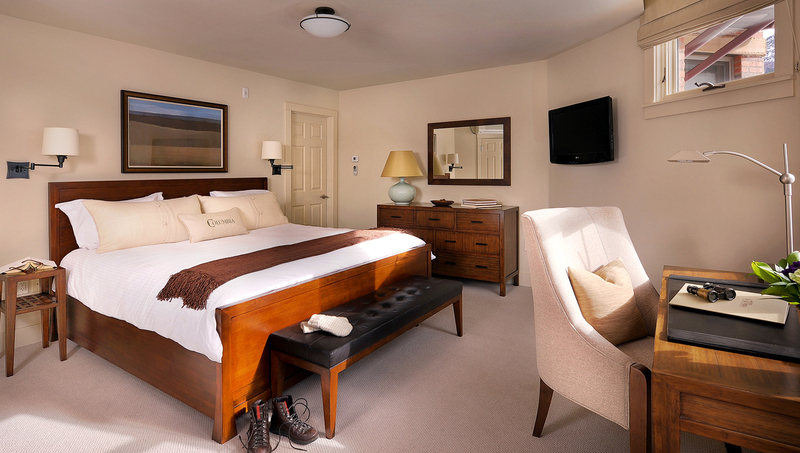 This 1 bedroom suite consists of two hotel rooms; #20 and #21.&gt; #20 has a king sized murphy bed along the northern wall. 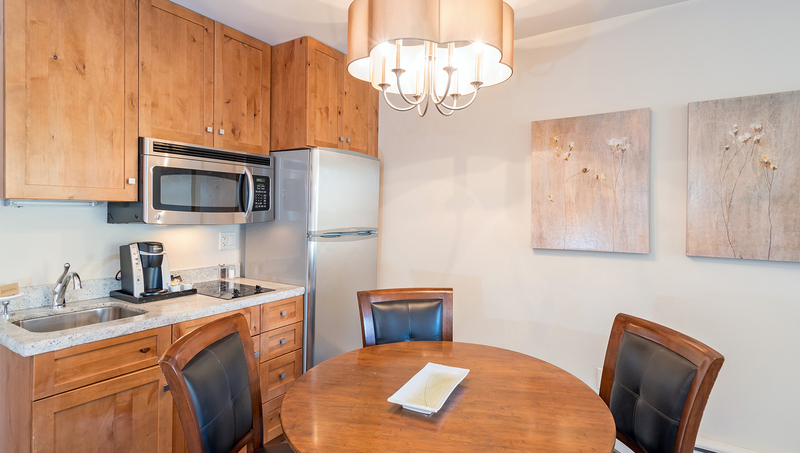 It also features a kitchenette with 2 burner stove top, full-sized fridge, microwave and Keurig coffee system. There is a dining area with seating for 3 guests. 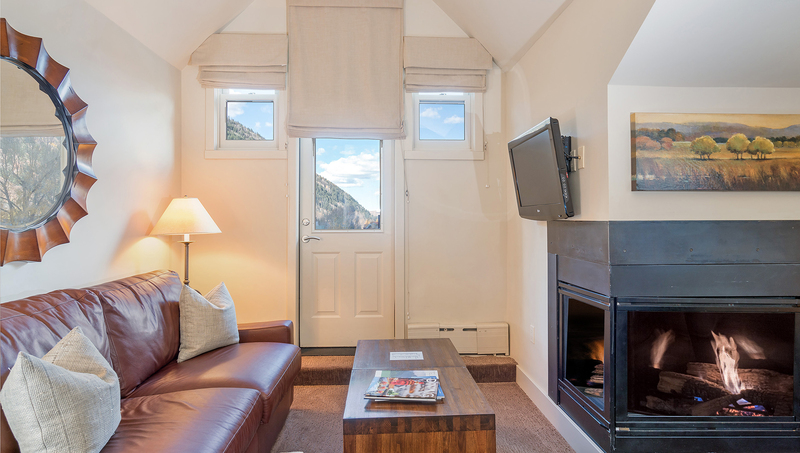 The sitting area offers lots of light and has a leather queen sleeper sofa, gas fireplace, flat screen TV and western views of Telluride. There is a large walk-in closet with 2 plush robes and a safe. 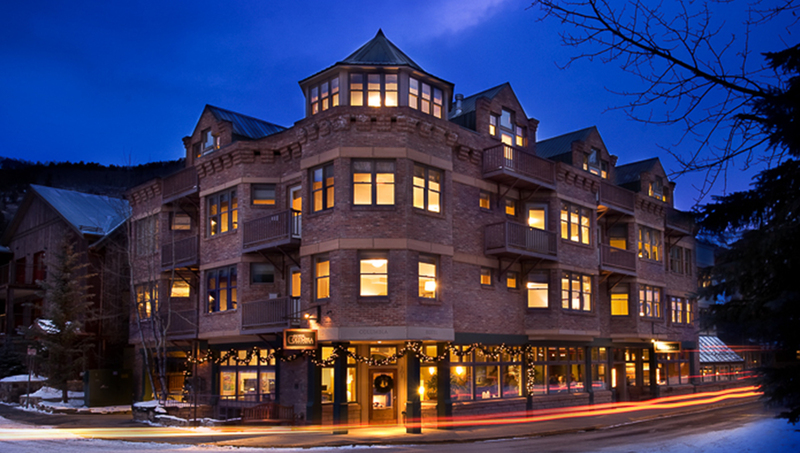 #21 has a regular king bed, small balcony, flat screen TV and Keurig coffee system and has windows looking west. 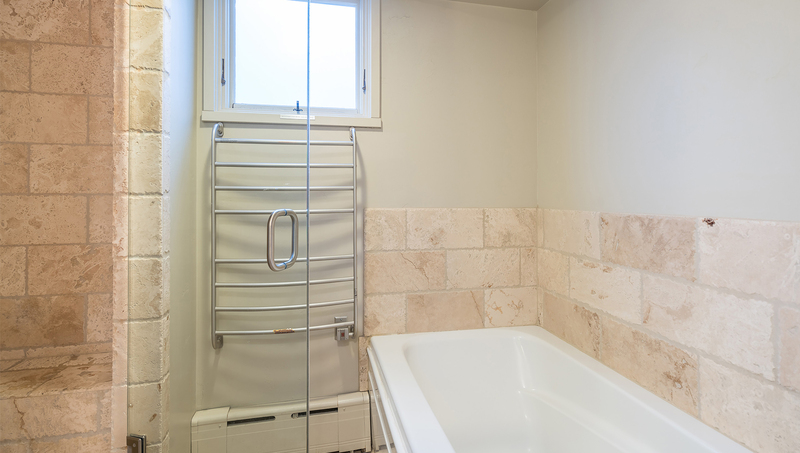 The bathroom has a shower only - no tub, and heated towel dryer. 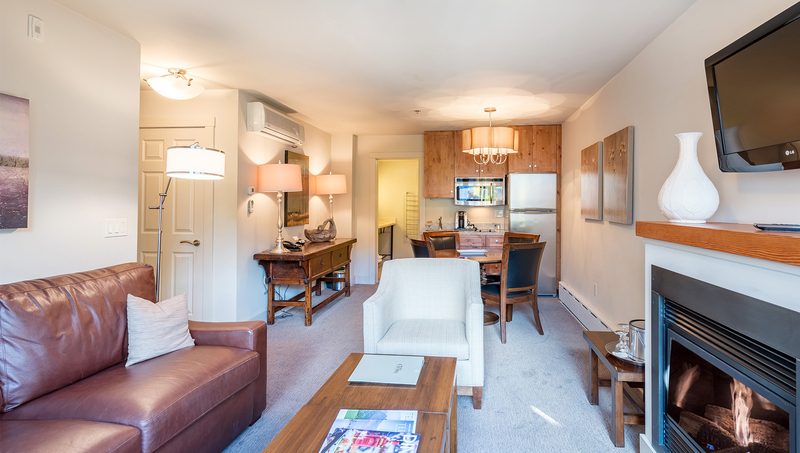 This condo is pet-friendly at $30 per night. Superior king hotel room on 2nd floor of Hotel Columbia. 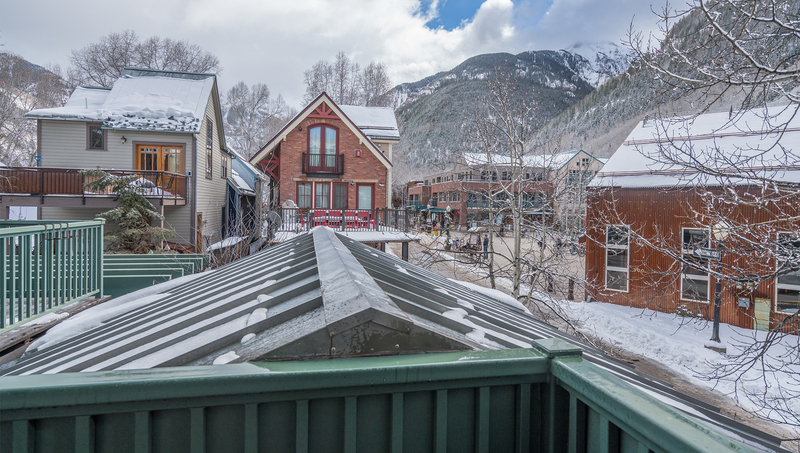 This 1 bedroom suite has a large open and light sitting area with turret windows, a leather queen sleeper sofa, gas fireplace, flat screen TV, half bath and southern and western views of Telluride and the gondola. There is also a west facing deck. 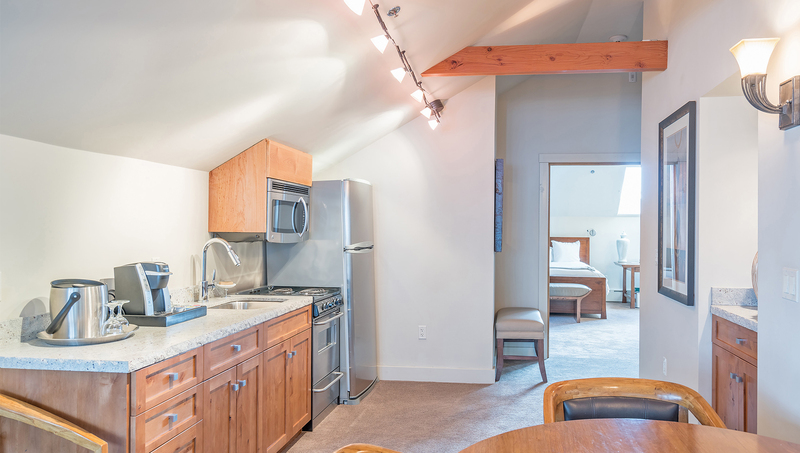 The condo features a kitchenette with 2 burner stove top, full-sized fridge, microwave and Keurig coffee system. There is a dining area with seating for 4 guests. 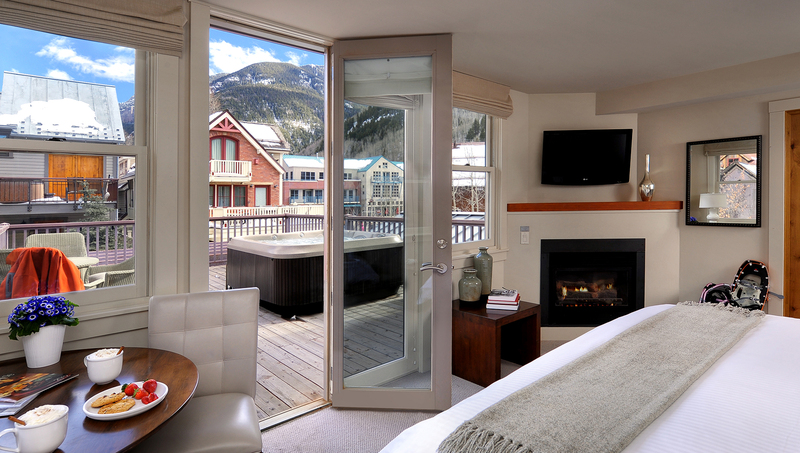 The bedroom has a king bed, flat screen TV and large windows overlooking the gondola. 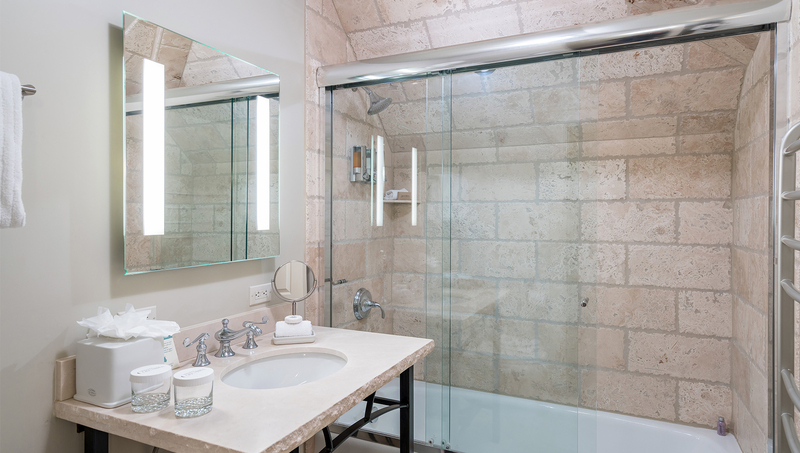 The bathroom has a shower only - no tub, and heated towel dryer. 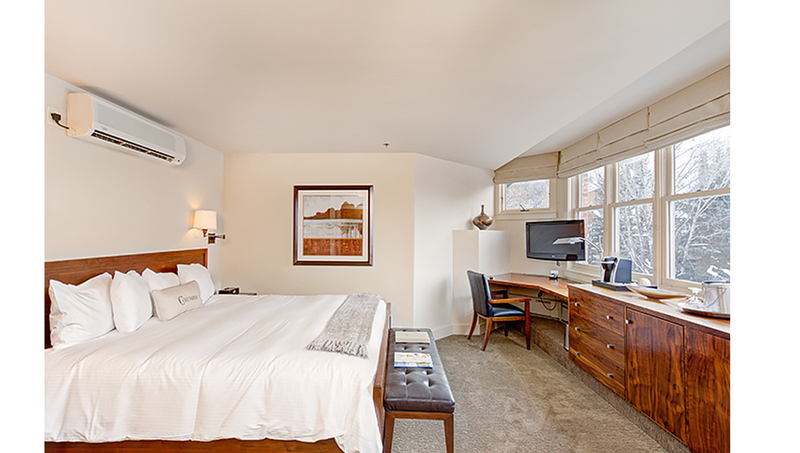 This room is pet-friendly at $30 per night. This hotel room has a king sized murphy bed along the western facing wall. 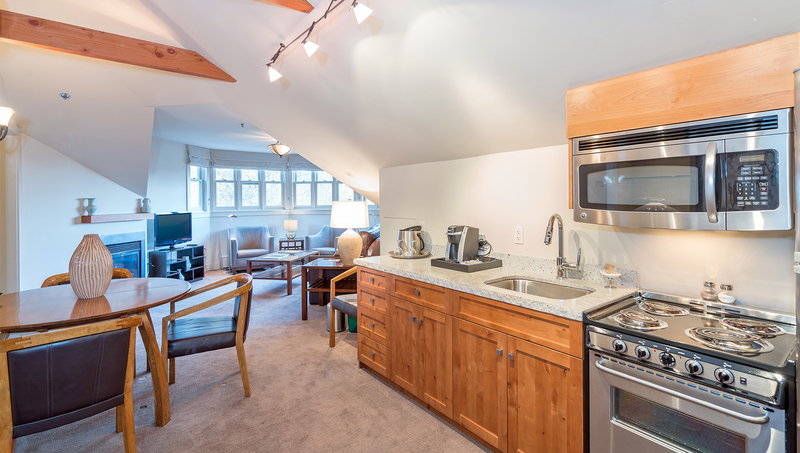 It also features a kitchenette with 2 burner stove top, mini-fridge, microwave and Keurig coffee system. 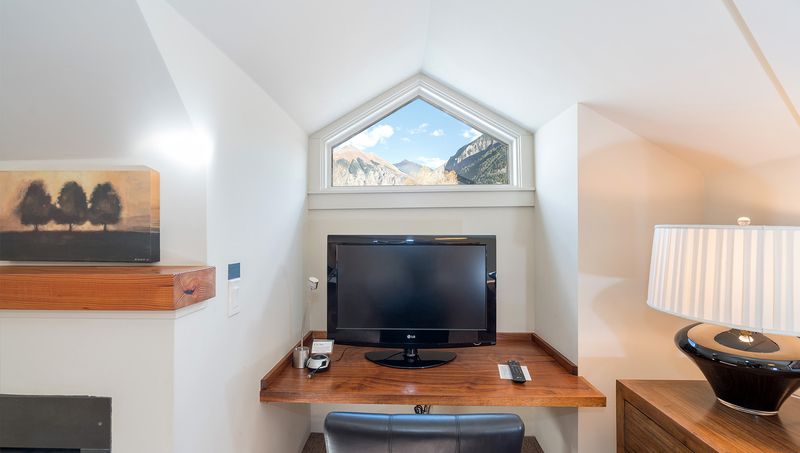 The room offers lots of light and has a flat screen TV and southern views of the gondola. 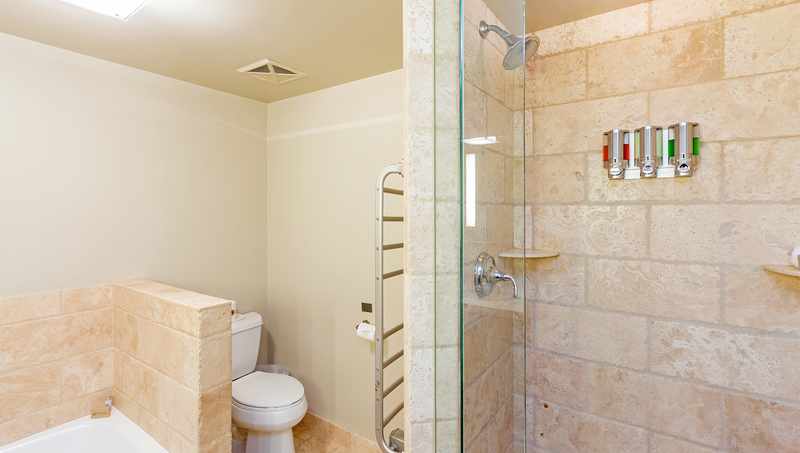 The large bathroom has a shower only, no tub, and heated towel dryer. This room is pet-friendly at $30 per night. This room is next to the elevator. 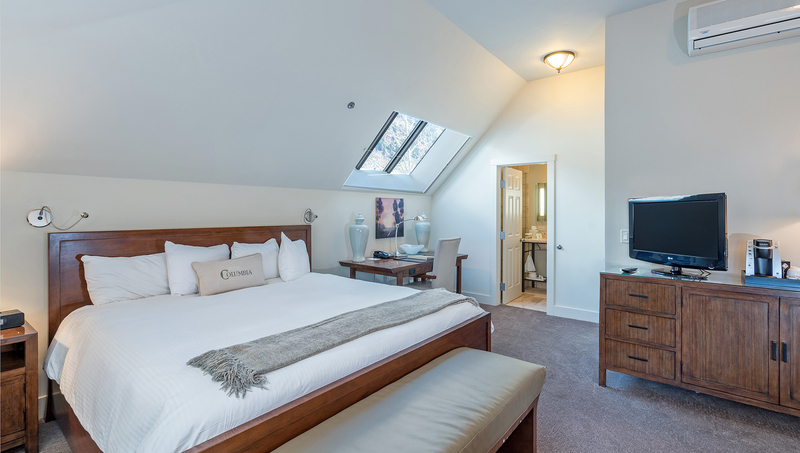 Premium 1 bedroom Suite on 2nd floor of Hotel Columbia. King murphy bed, king bed. 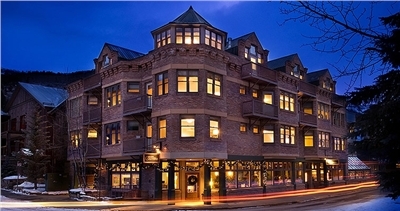 This condo consists of 2 hotel rooms; #23 and #24. #23 has a king-sized murphy bed along the western wall, a kitchenette with 2-burner stove top, mini-fridge, microwave and Keurig coffee system. 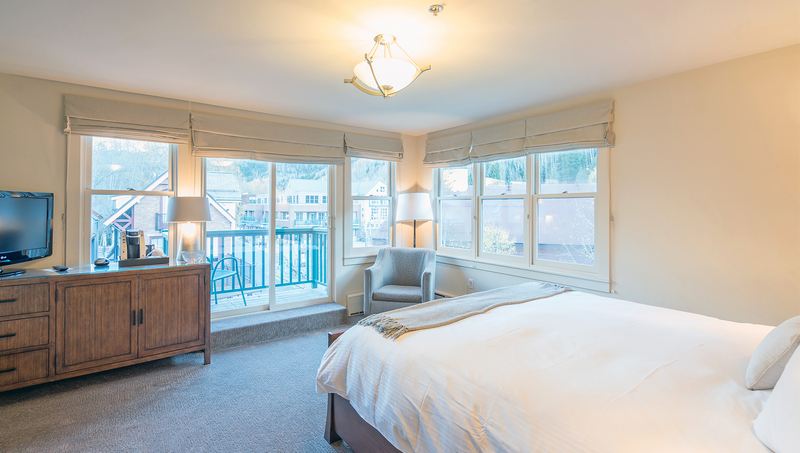 The room offers lots of light and has a flat screen TV and southern views of the gondola. 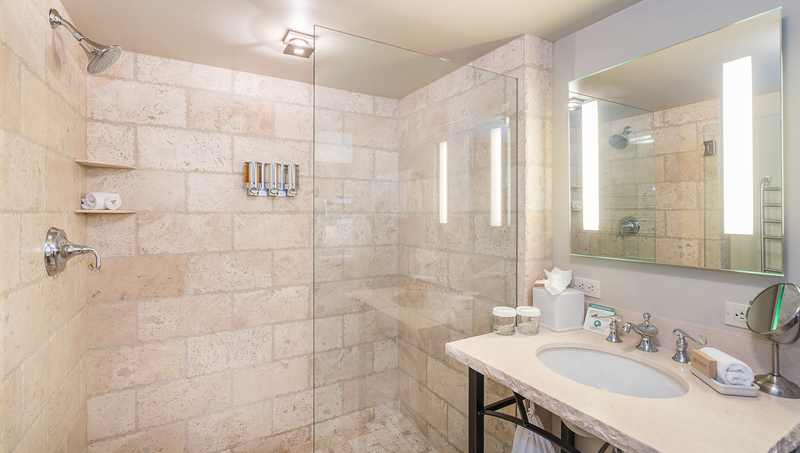 The large bathroom has a heated towel dryer and walk-in shower. Superior King hotel room on 2nd floor of Hotel Columbia. Corner room. 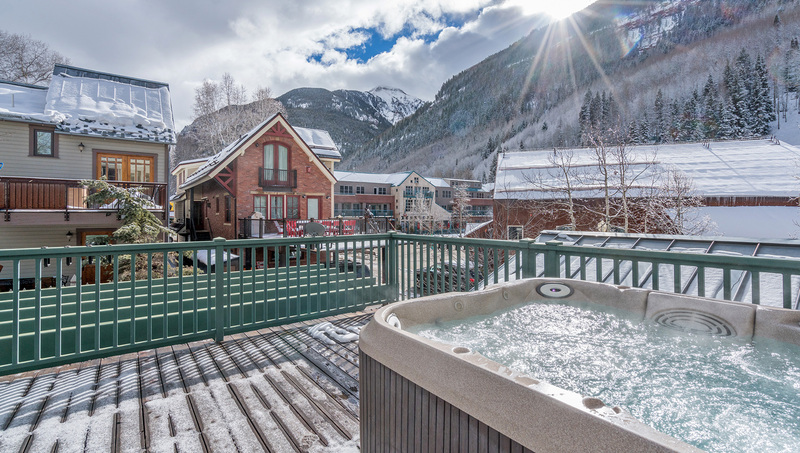 Premium 1 bedroom Suite with private outdoor hot tub on 2nd floor of Hotel Columbia. One of the most popular suites in the hotel. 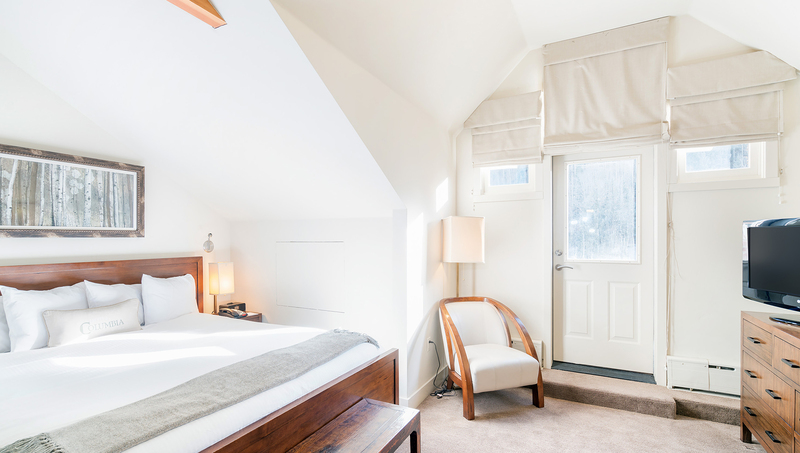 #25 is a corner room with a king-sized bed, mini-bar and Keurig coffee system. 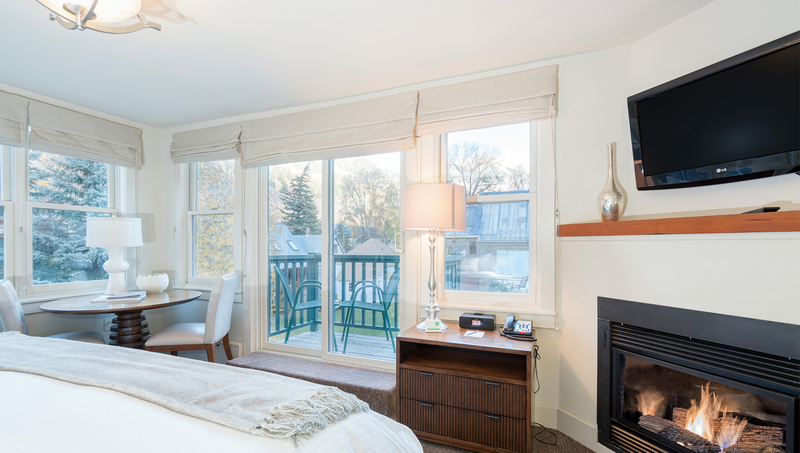 The room offers lots of light and has a flat screen TV, and private deck facing east. 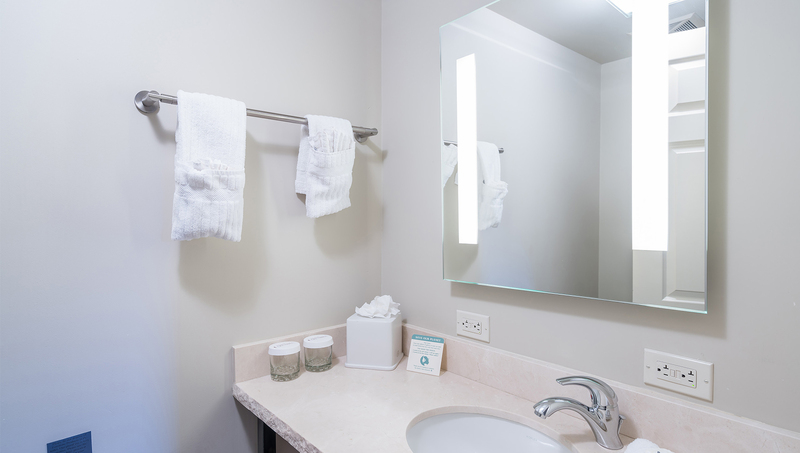 The bathroom has a heated towel dryer and separate bath tub and walk-in shower. Premium King hotel room with private outdoor hot tub on 2nd floor of Hotel Columbia. One of the most popular rooms in the hotel - corner room. 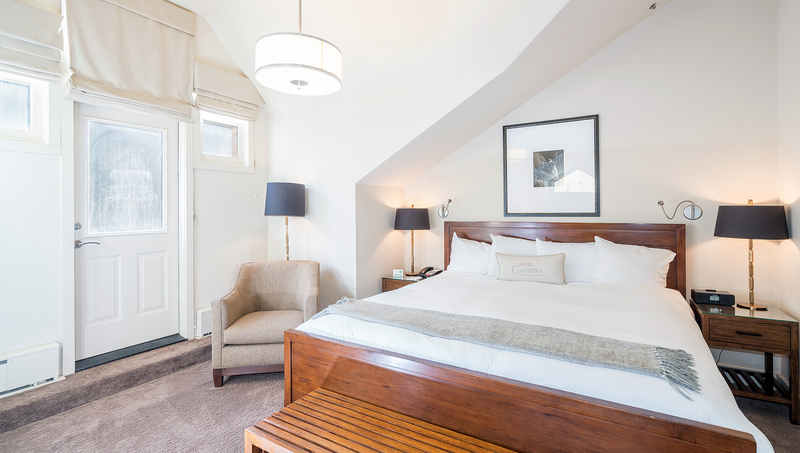 Standard 1 bedroom Suite on 2nd floor of Hotel Columbia. Queen bed, queen sleeper sofa. 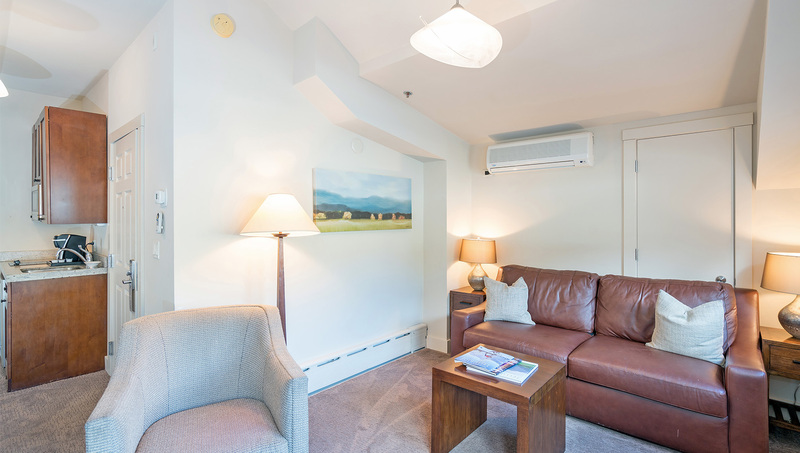 This suite has a leather queen sleeper sofa and kitchenette with 2 burner stove top, full-sized fridge, microwave and Keurig coffee system. There is a dining area with seating for 4 guests. 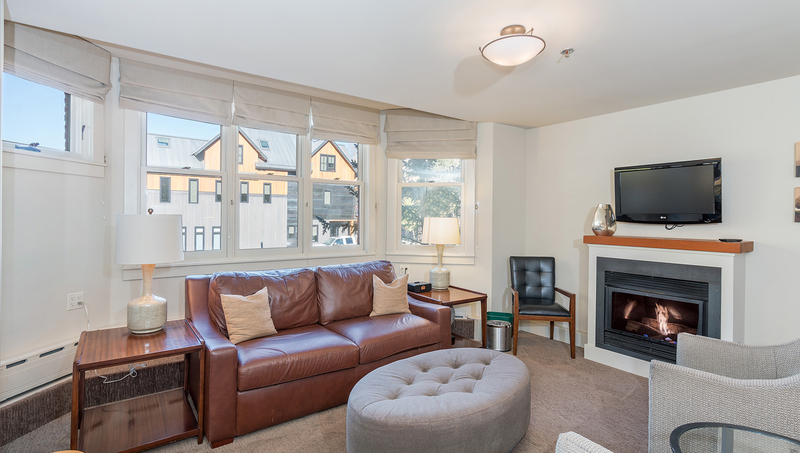 The sitting area has a gas fireplace, flat screen TV and small balcony looking east with partial views. The bedroom has a queen bed and flat screen TV. 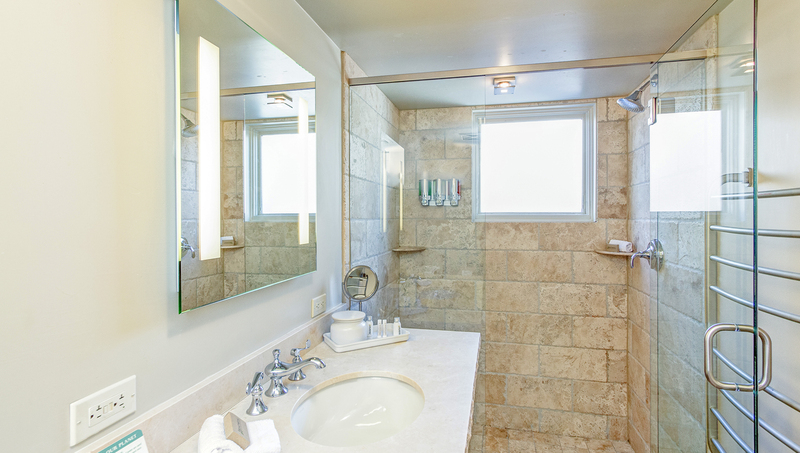 The large bathroom has a heated towel dryer and separate walk-in shower. 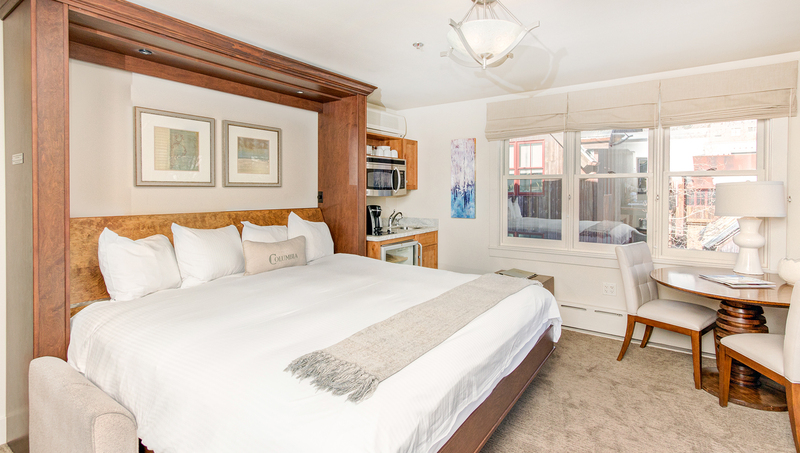 This condo is pet-friendly at $30 per night. Premium king hotel room on 3rd floor of Hotel Columbia. Premium 1BR suite on 3rd floor of Hotel Columbia. 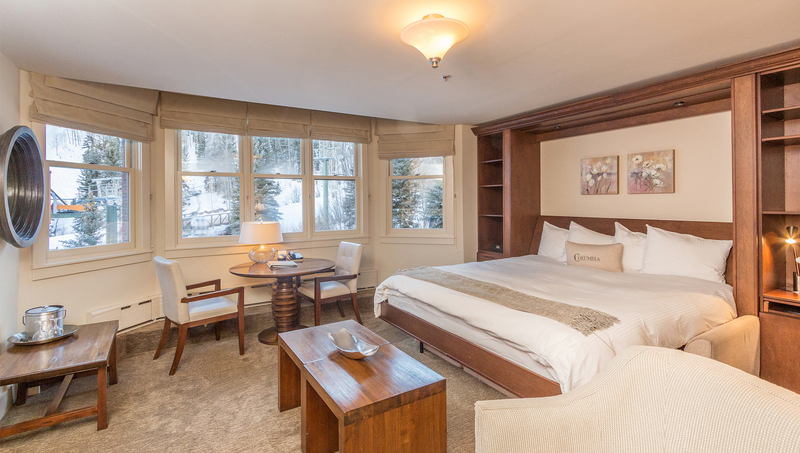 This 1 bedroom suite consists of two hotel rooms; #30 and #31. #30 has a king sized murphy bed along the northern wall. 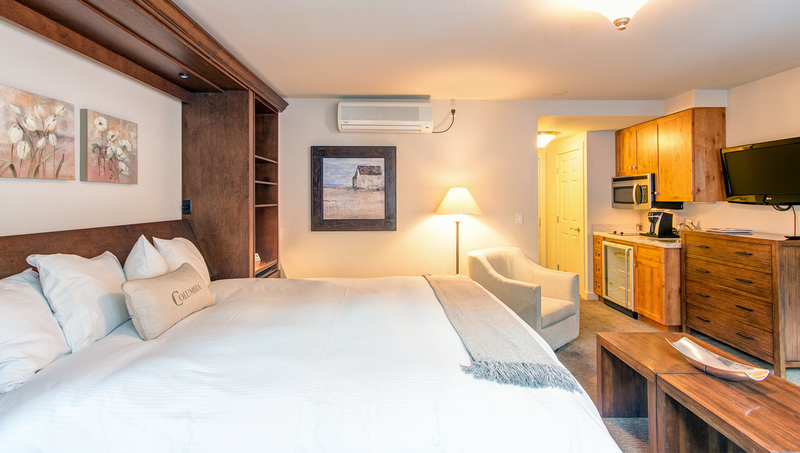 It also features a kitchenette with 2 burner stove top, full-sized fridge, microwave and Keurig coffee system. There is a dining area with seating for 3 guests. 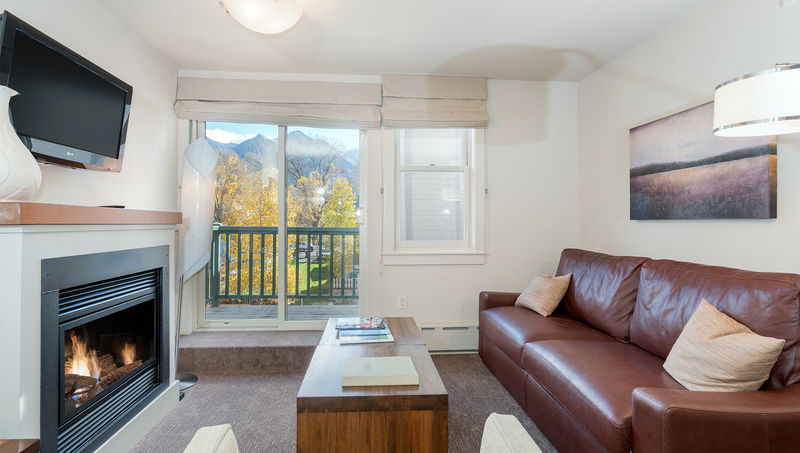 The sitting area offers lots of light and has a leather queen sleeper sofa, gas fireplace, flat screen TV and western views of Telluride. There is a large walk-in closet with 2 plush robes and a safe. Superior king hotel room on 3rd floor of Hotel Columbia. 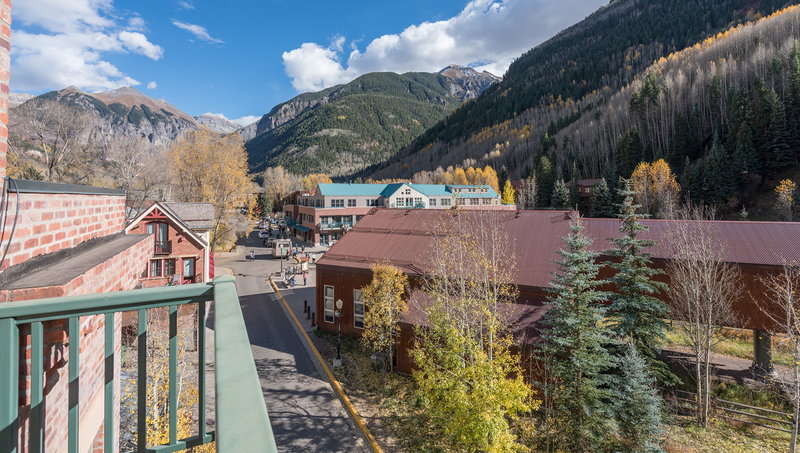 This 1 bedroom suite has a large open and light sitting area with turret windows and a leather queen sleeper sofa, gas fireplace, flat screen TV, half bath and southern and western views of Telluride and the gondola. There is also a west facing deck. 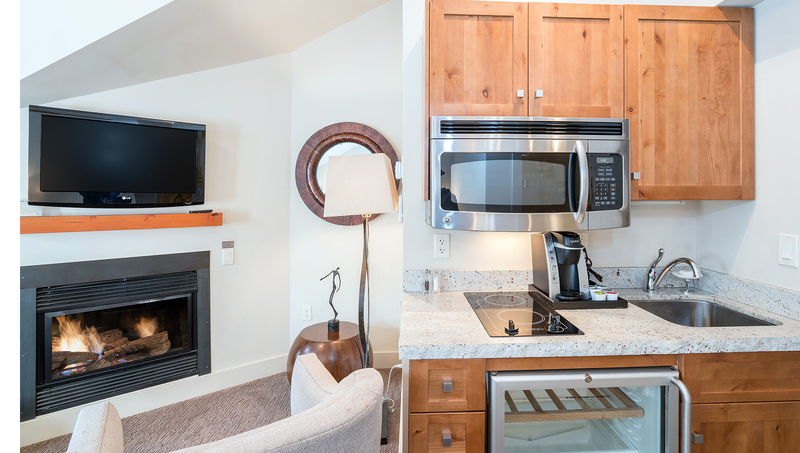 The condo features a kitchenette with 2 burner stove top, full-sized fridge, microwave and Keurig coffee system. There is a dining area with seating for 4 guests. 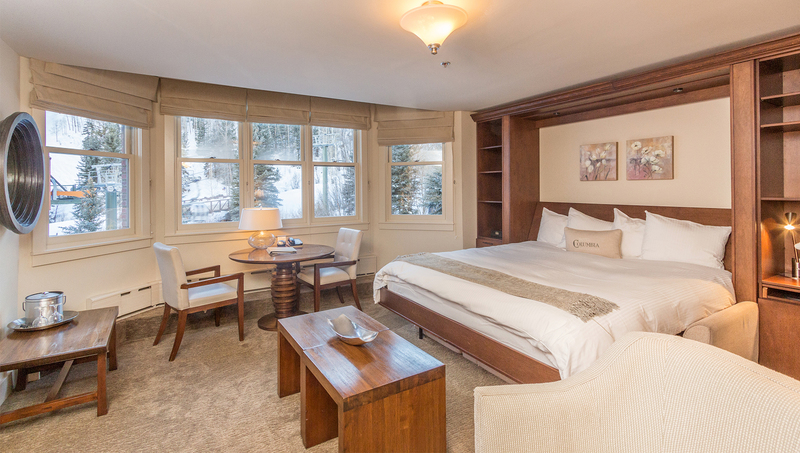 The bedroom has a king bed, flat screen TV and large windows overlooking the gondola. 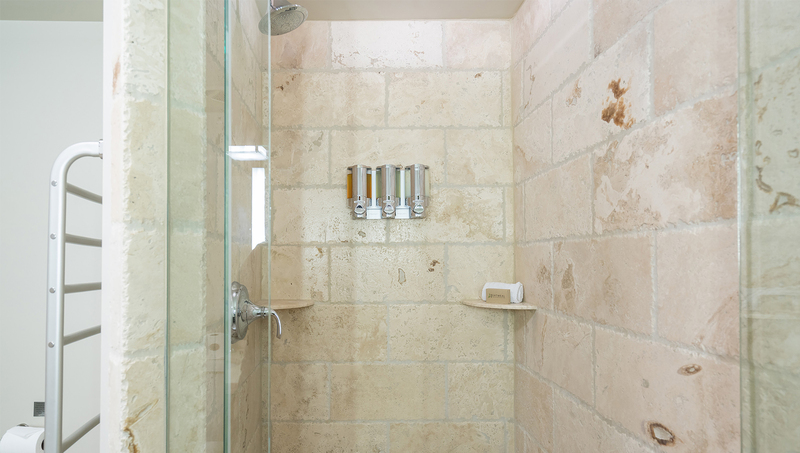 The bathroom has a shower only - no tub, and heated towel dryer. This hotel room has a king sized murphy bed along the western facing wall. 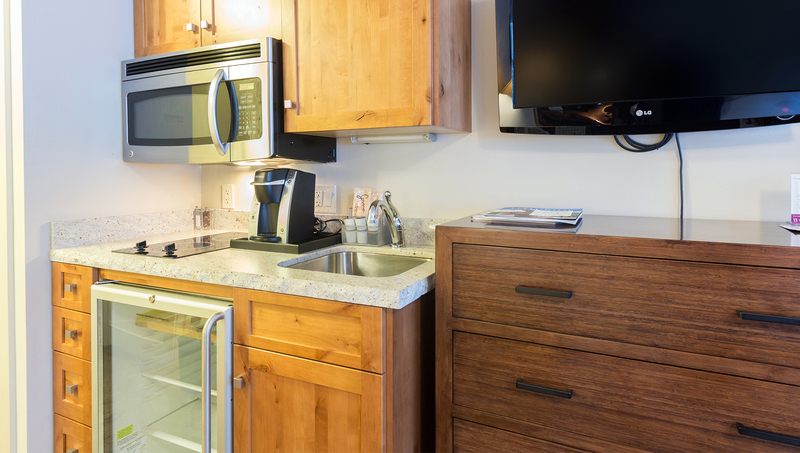 It also features a kitchenette with 2 burner stove top, mini-fridge, microwave and Keurig coffee system. The room offers lots of light and has a flat screen TV and southern views of the gondola. 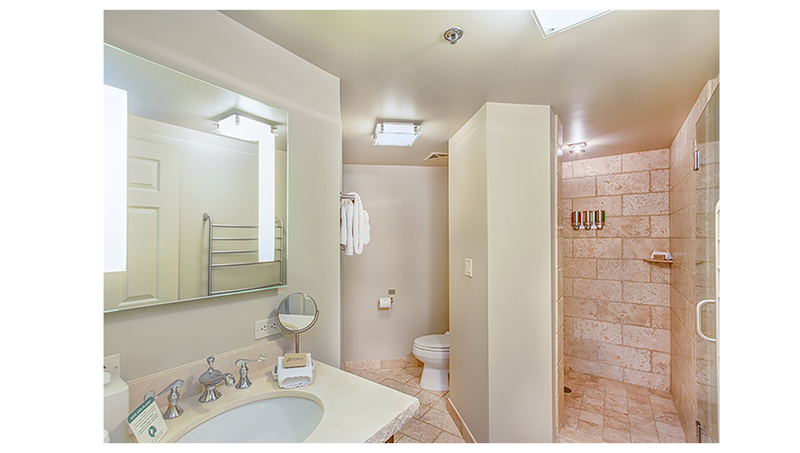 The large bathroom has a shower only, no tub, and heated towel dryer. This room is next to the elevator. 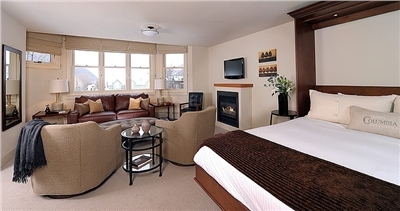 Premium 1 bedroom Suite on 3rd floor of Hotel Columbia. 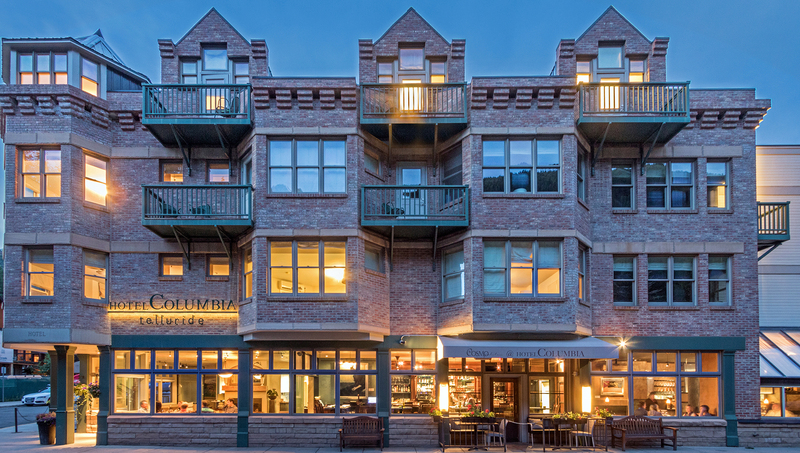 This condo consists of 2 hotel rooms; #33 and #34. #33 has a king-sized murphy bed along the western wall, a kitchenette with 2-burner stove top, mini-fridge, microwave and Keurig coffee system. 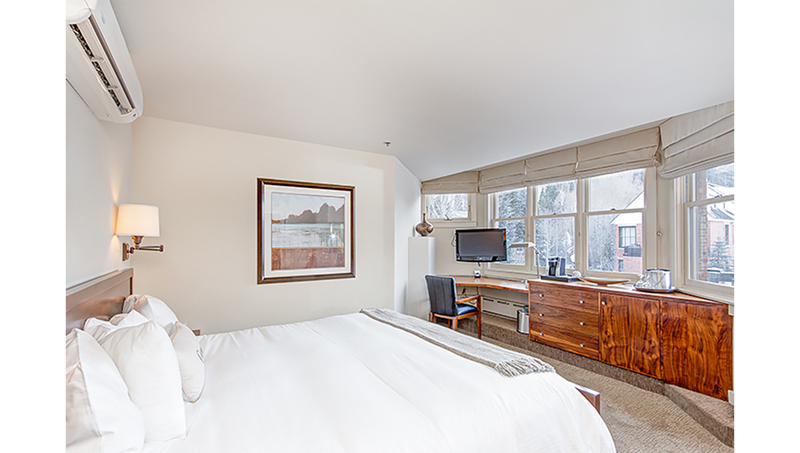 The room offers lots of light and has a flat screen TV and southern views of the gondola. 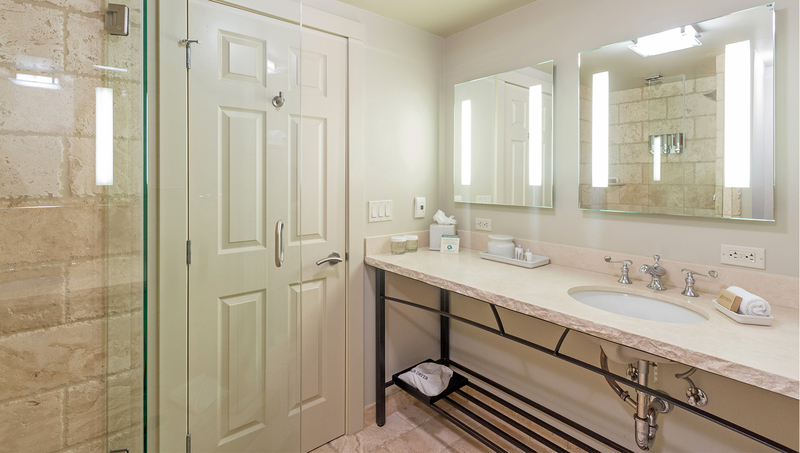 The large bathroom has a heated towel dryer and walk-in shower. 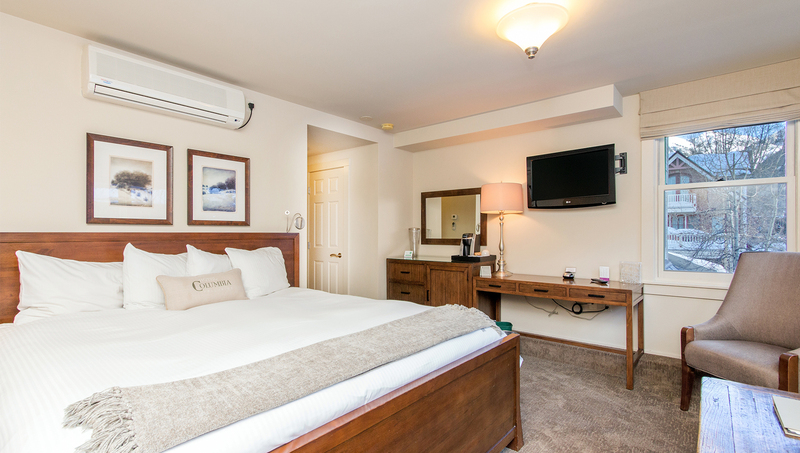 #34 has a king bed, flat screen TV and large bathroom with separate tub and walk-in shower, as well as heated towel dryer. Superior King hotel room on 3rd floor of Hotel Columbia. Corner room. This light hotel room has a king-sized bed flat screen TV, mini bar and Keurig coffee system. 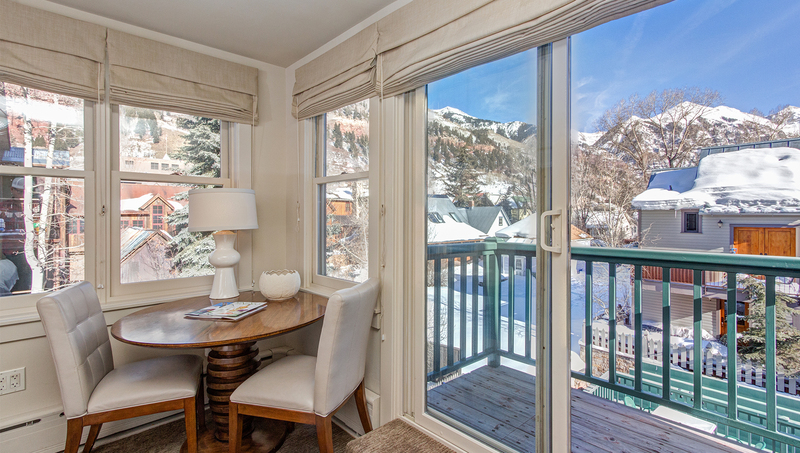 The room offers lots of light and has a deck with eastern views of Telluride and the mountains. 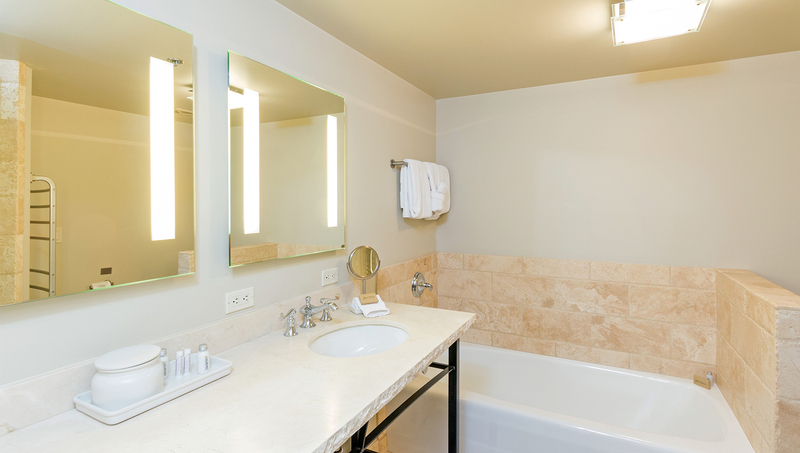 The large bathroom has a heated towel dryer and separate bathtub and walk-in shower. 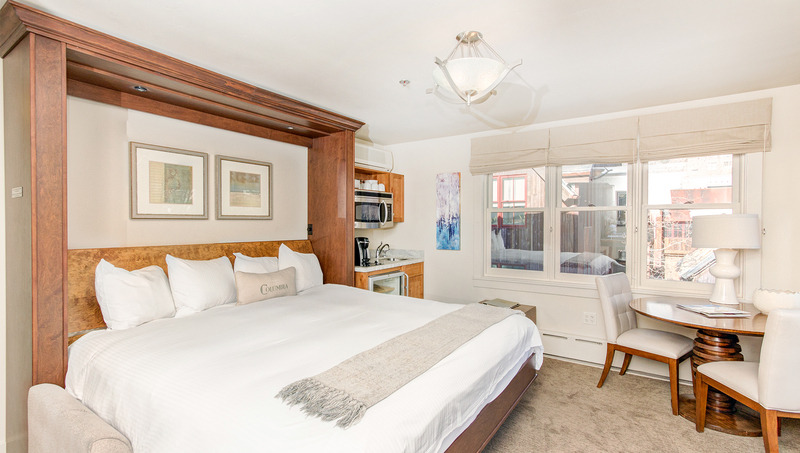 #35 is a corner room with a king-sized bed, mini-bar and Keurig coffee system. 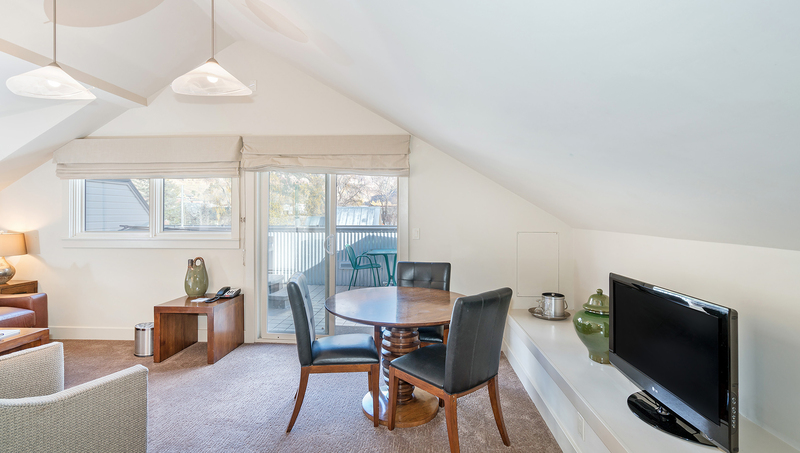 The room offers lots of light and has a flat screen TV, and private deck facing east. 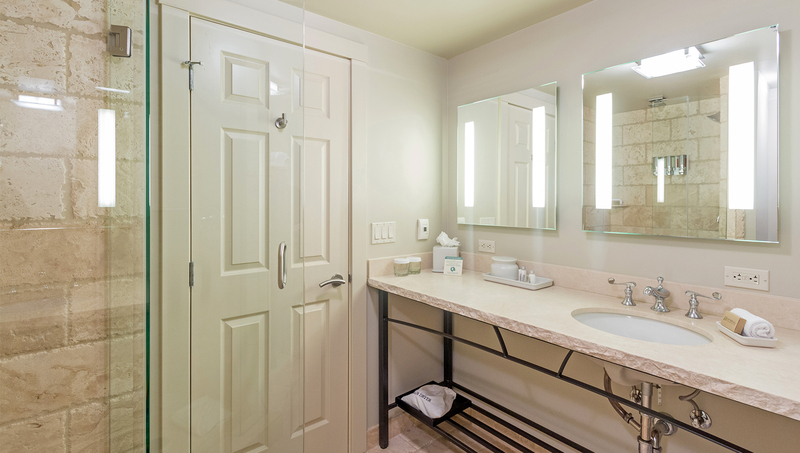 The bathroom has a heated towel dryer and separate bath tub and walk-in shower. 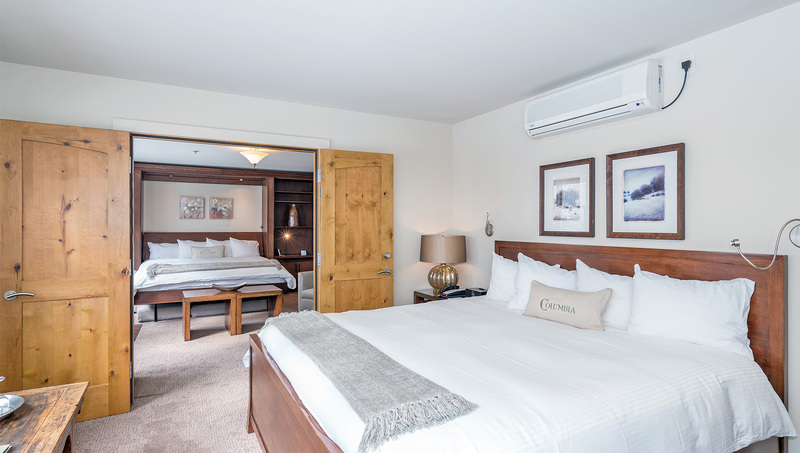 #36 has a king murphy bed, kitchenette with 2-burner stove top, mini-fridge and microwave, flat screen TV, gas fireplace and balcony with eastern views. This hotel room has a king-sized murphy bed, a kitchenette with 2-burner stove top, mini-fridge, microwave and Keurig coffee system. 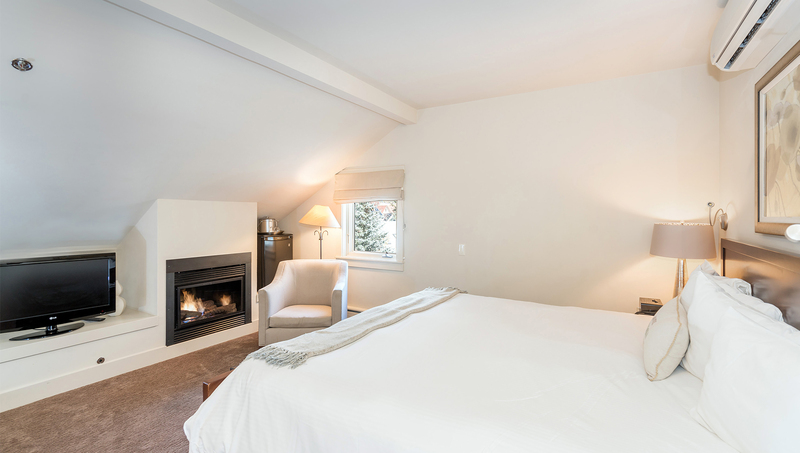 The room offers lots of light and has a flat screen TV, gas fireplace and balcony facing east. 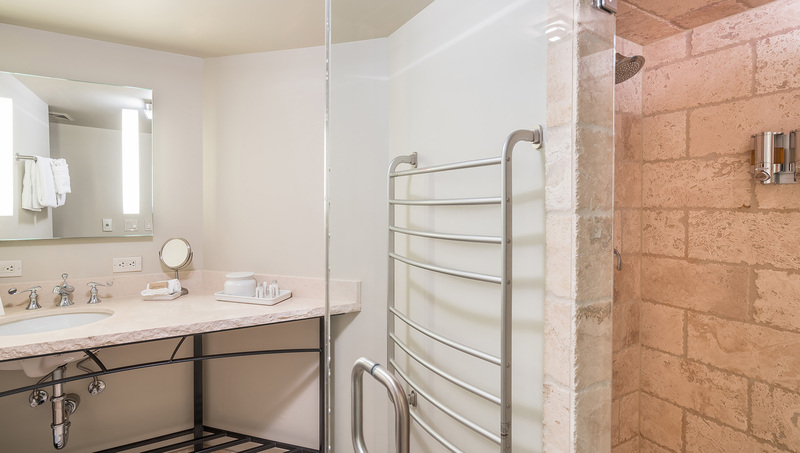 The bathroom has a heated towel dryer and walk-in shower. Standard 1 bedroom Suite on 3rd floor of Hotel Columbia. 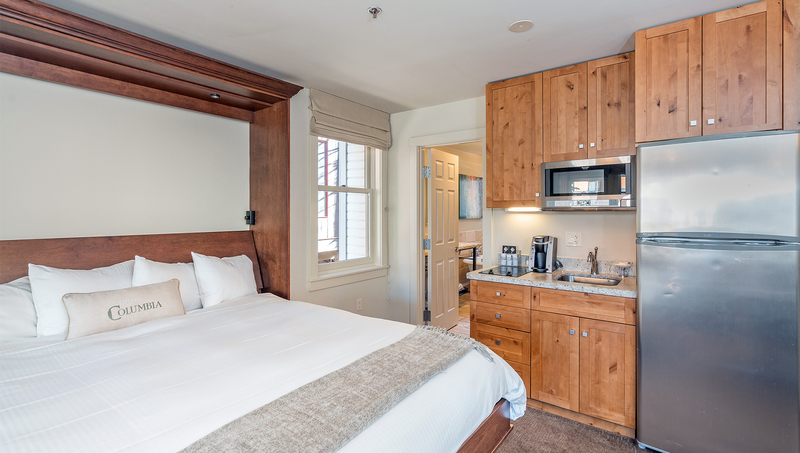 This suite has a leather queen sleeper sofa and kitchenette with 2 burner stove top, full-sized fridge, microwave and Keurig coffee system. There is a dining area with seating for 4 guests. 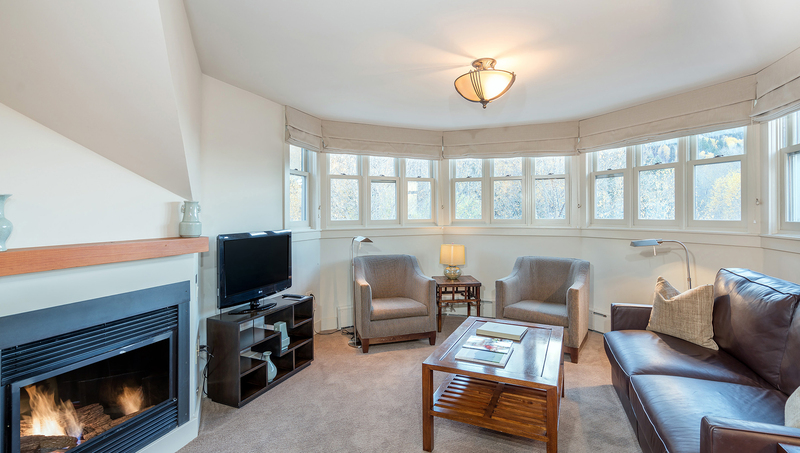 The sitting area has a gas fireplace, flat screen TV and small balcony looking east with partial views. The bedroom has a queen bed and flat screen TV. 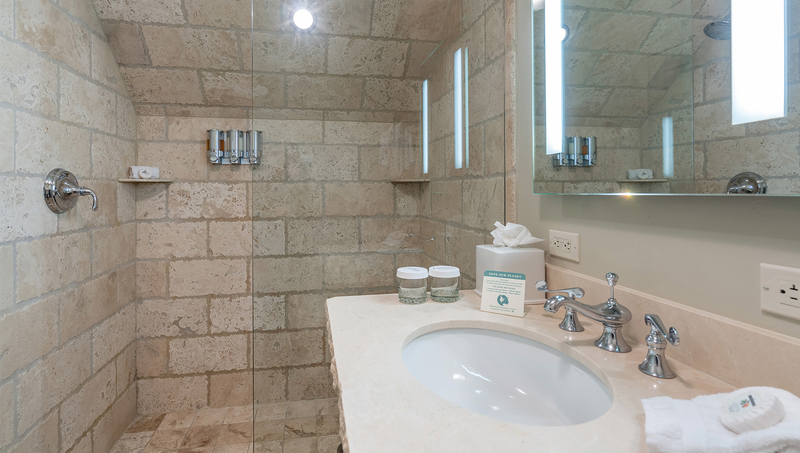 The large bathroom has a heated towel dryer and separate walk-in shower. Premium king hotel room on 4th floor of Hotel Columbia. 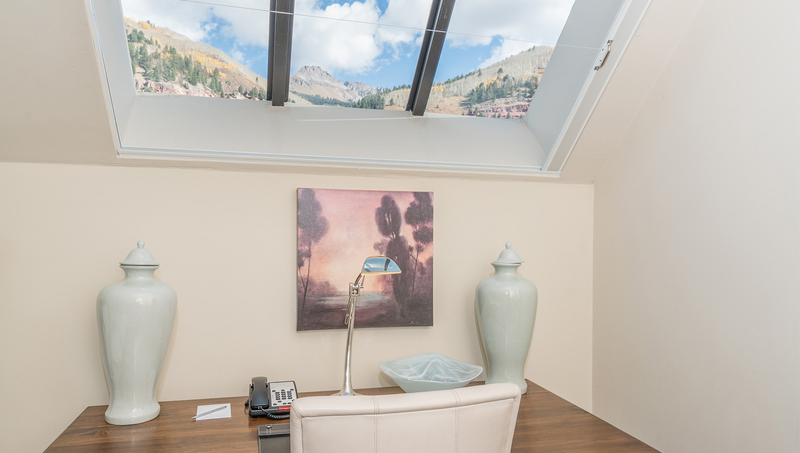 This hotel room offers lots of light and has a great skylight. It has a king sized bed along the northern wall. It also features a mini bar and Keurig coffee system. 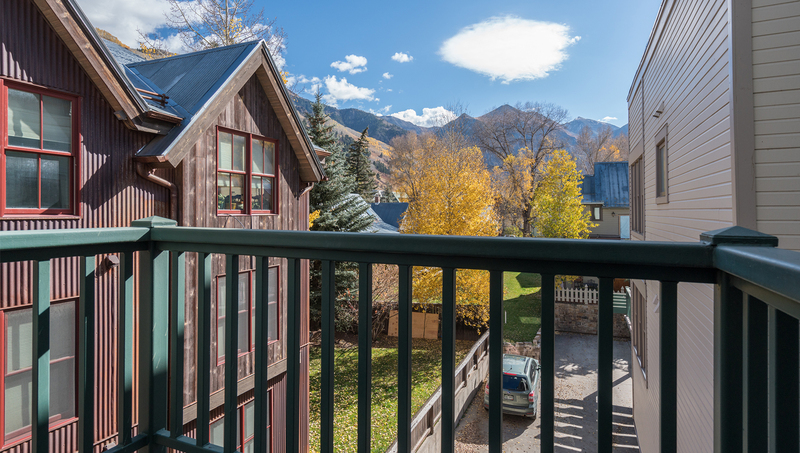 The sitting area offers lots of light and has a leather queen sleeper sofa, gas fireplace, flat screen TV and balcony with western views of Telluride. 2 Bedroom penthouse on 4th floor of Hotel Columbia. King bed, king bed, 2 queen sleeper sofas. 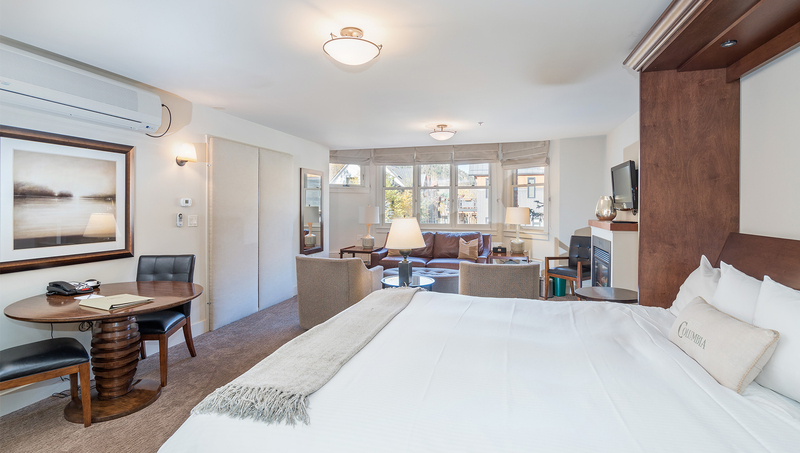 This condo consists of a hotel room and a 1 bedroom suite; #40 and #41. 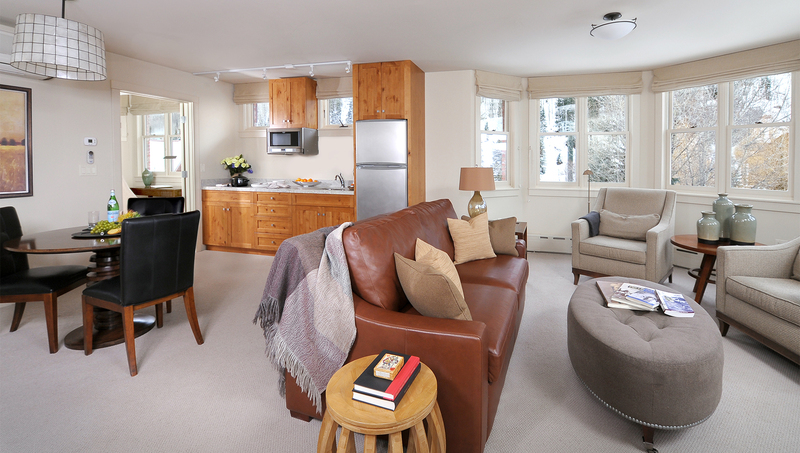 #41 has a sitting area that offers lots of light with turret windows overlooking the gondola and has a leather queen sleeper sofa, gas fireplace and flat screen TV. There is a full kitchen and dining area with seating for 4 guests. The bedroom has a king bed and flat screen TV. There is also a large deck off the bedroom. 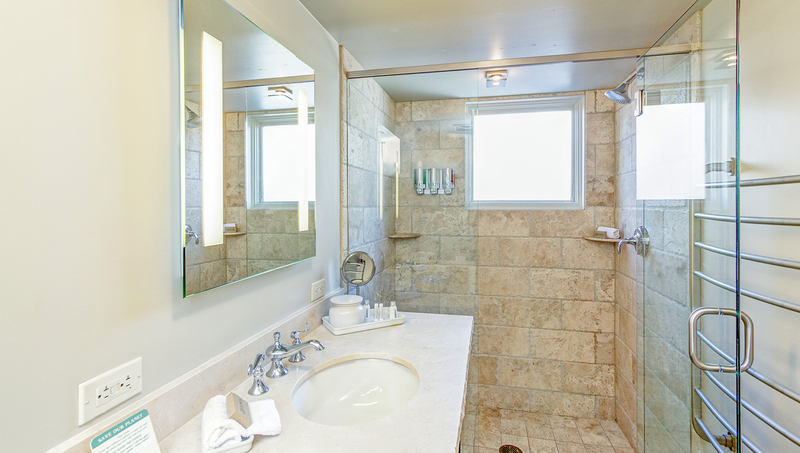 The large bathroom has a heated towel dryer and separate walk-in shower. #40 offers lots of light as well and has a great skylight. It has a king sized bed along the northern wall. It also features a mini bar and Keurig coffee system. 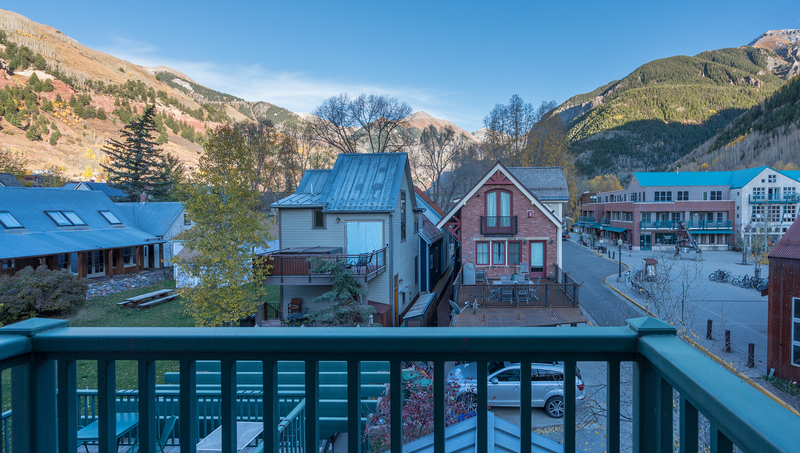 The sitting area offers lots of light and has a leather queen sleeper sofa, gas fireplace, flat screen TV and balcony with western views of Telluride. 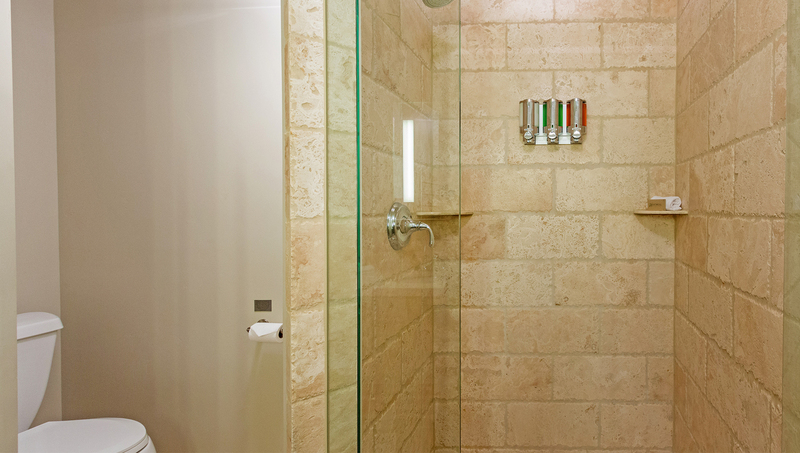 The bathroom has a heated towel dryer and separate walk-in shower. 3 Bedroom penthouse on 4th floor of Hotel Columbia. King bed, king bed, king bed, 2 queen sleeper sofas. 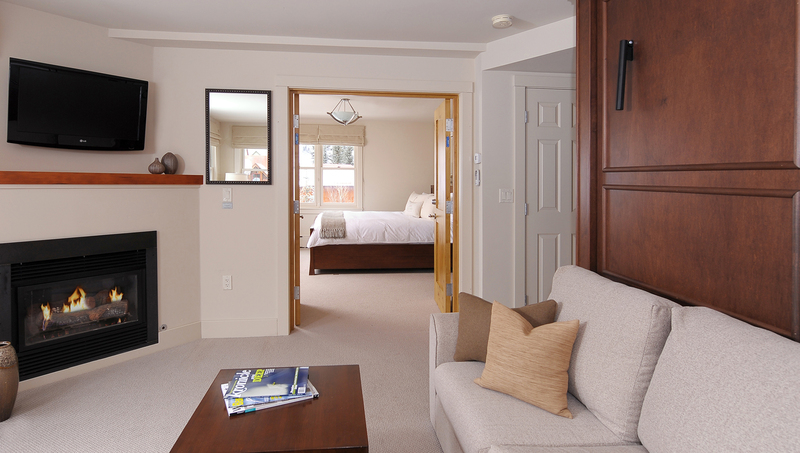 This condo consists of 2 hotel rooms and a 1 bedroom suite; #40, #41 and #44. 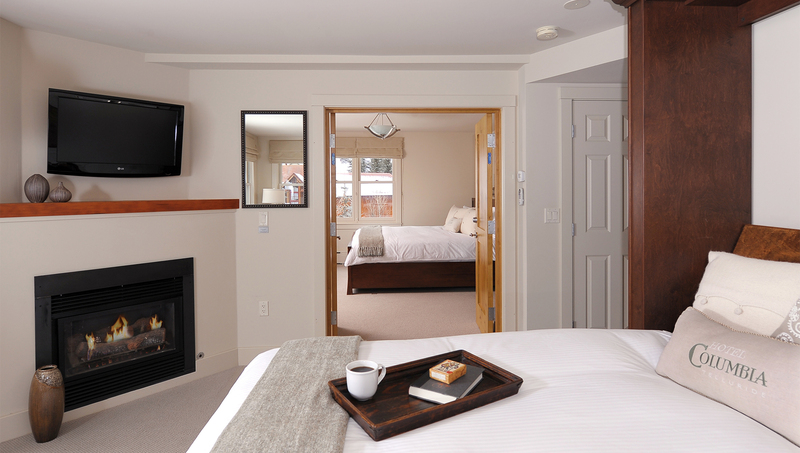 #44 has a king bed, gas fireplace, flat screen TV and mini bar and small window facing east. 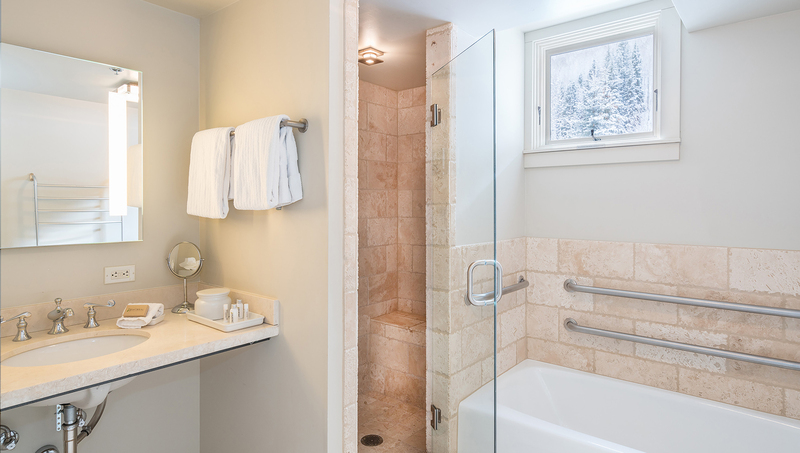 The bathroom has a tub and heated towel dryer. Premium 1 bedroom Suite on 4th floor of Hotel Columbia. Very light room with lots of windows. 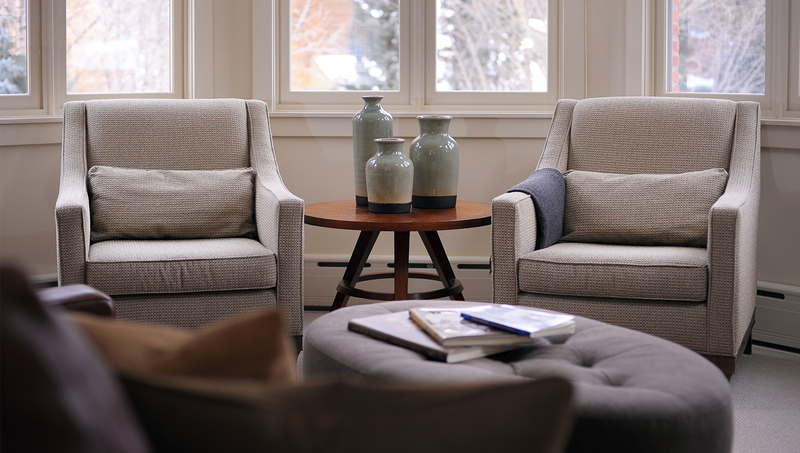 The sitting area offers lots of light with turret windows overlooking the gondola and has a leather queen sleeper sofa, gas fireplace and flat screen TV. There is a full kitchen and dining area with seating for 4 guests. Superior King hotel room on 4th floor of Hotel Columbia. 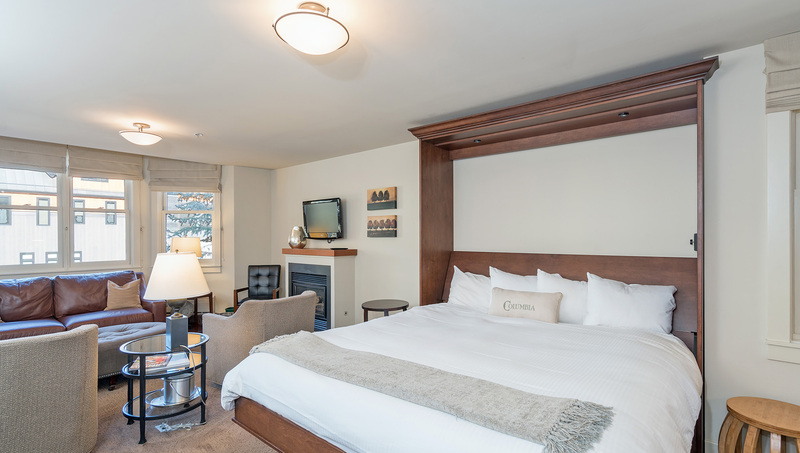 This hotel room has a king bed, gas fireplace, flat screen TV and kitchenette with 2-burner stove top, mini-fridge, microwave and Keurig coffee system. 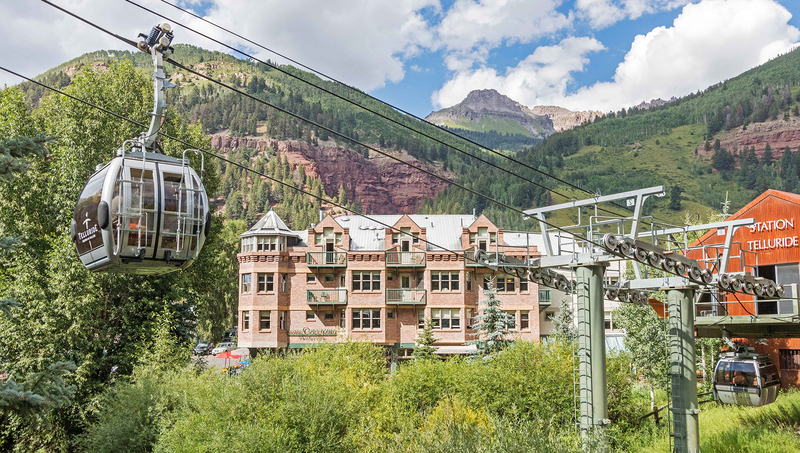 Balcony overlooking the gondola. 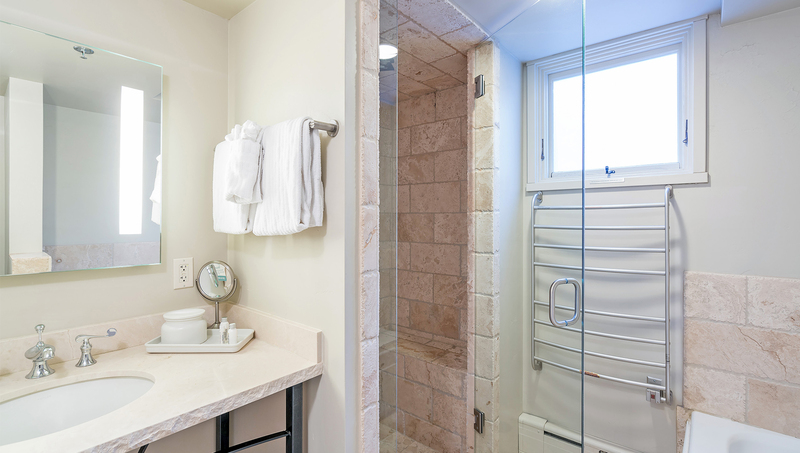 The large bathroom has a walk-in shower and heated towel dryer. 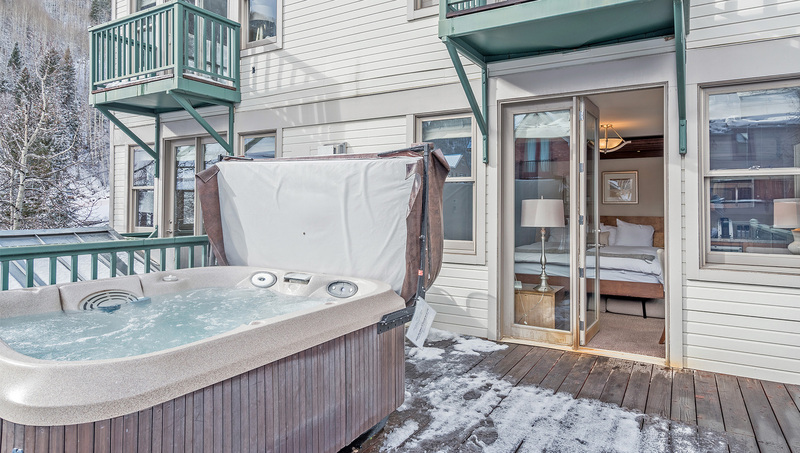 Premium 1 bedroom Suite with private outdoor hot tub on 4th floor of Hotel Columbia. Unique layout. 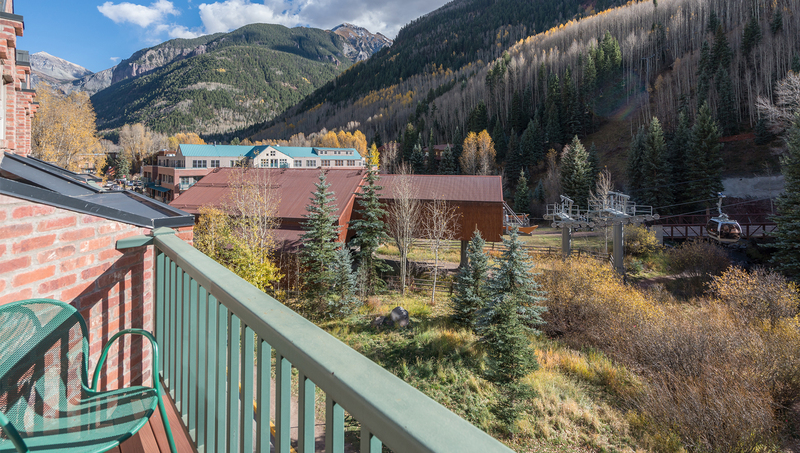 One of the most popular condos in the hotel! 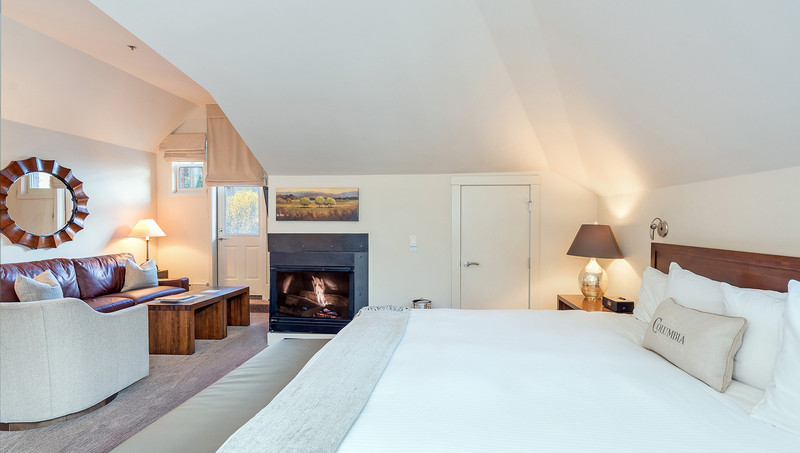 This 1 bedroom suite has a sitting area with leather queen sleeper sofa, flat screen TV and a large deck with private outdoor hot tub facing east - great views! 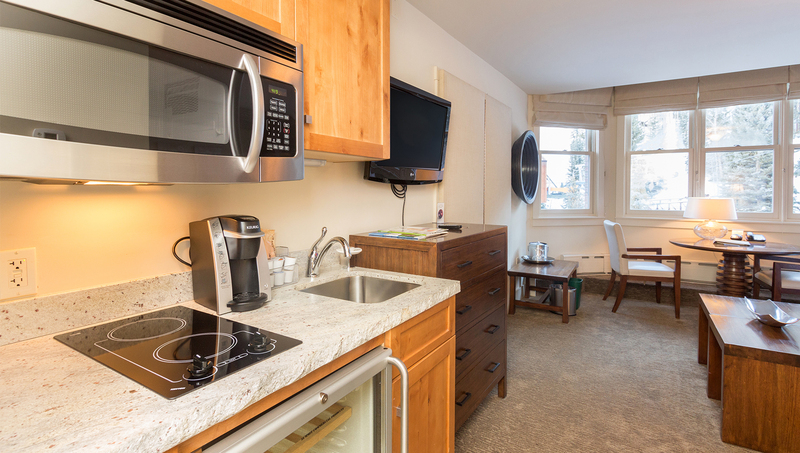 There is also a kitchenette with 2-burner stove top, mini-fridge, microwave and Keurig coffee system.